Looking at British Y dna might be very telling for the origins of the minor Haplogroups in the Isles, since we have a good idea of British Y dna from Neolithic through Bronze Age we can assume many of the other Y lines came in through the Celts, Roman occupation, Anglo-Saxons and Normans. Just by focusing on Roman occupation and the Normans there might be clues to the origins of some the clades we see in the British Isles, the Roman occupation is not limited to Italians from Italy but also all the Auxiliaries in Britain. As a prime example the J1-L1253 branch could have came from the I Hamiorum cohort, Hamiorum is the Latin name for Hama in Syria. It also gives big implications for E-V13 since there was many Illyrian and Thracian units it would make sense by default that whatever V13 subclades are found cannot be Greek in origin, and there are probably quite a few branches that are Celtic and Italic in origin as well. To include the Normans since there is no North African Auxiliary units in Roman Britain, its possible that all the E-M81 was brought in by the Normans, there was a North African Auxiliary unit in Germania Inferior province (Afrorum veterana) and it could be likely that on their way to England they picked up mercenaries on the way, the locals could have a wide variety of Y dna. I think looking at E, J1 and J2 in Britain might actually be very telling. The main point will be to try and see patterns amongst the Auxiliary units in Britain and specific Y clades, and also to see where the same Auxiliary units were used in other provinces and see if connections can be made. Last edited by Principe; 12-10-2018 at 05:09 PM. Since the only "ancient" sample of DF19 anywhere is from a Roman burial in York, apparently with nothing subsequent found until modern times, I'd be really happy to see an in-depth analysis of all the "minor" subclades in the era including neighboring regions. I’ll look more in detail as the days pass, it’s my busy time at school with exams and essays, I left the two wiki pages so people can start to come up with connections, those 2 pages and ftdna projects are a great way to start. Just as a quick example of a connection, you see E-V13>L17 clades appear exactly where Auxiliary troops from Austrias were stationed. Last edited by Principe; 12-11-2018 at 06:34 PM. I am E-Y45878. The other person states that his most distant male ancestor comes from Cornwall. Archaic testing suggests that haplogroup E and J are not recent influences in the last 2,000 or 3,000 years. There could be some additive affect of long distance movement but I would think E and J are major players prior the influx R1b during the bronze age. At one time, everyone believed that R1b moved in after the last major ice age - but archaic testing found no R1b prior to the bronze age. Also Q is very common in early parts of Germany as well. So the last big ice age depopulated all of the northern part of Europe. Then E, J and Q were dominant for several thousands year after the last ice age. Then R1b came during the bronze age. But the open question is how such a massive replacement of previous haplogroups were replaced by R1b so rapidly and completely. A new discovery in Scandinavia reveals a more virulent form of the plague was discovered several thousand years before the dark ages. This virulent strain of the plague may have caused massive depopulation across most of Europe and left a lot of open land for R1b to move in to fill this void. Last edited by RobertCasey; 12-12-2018 at 02:25 AM. these Illyrian cohor are made up of only 3 dalmatian and 4 pannonian ones. Since the first of these formed after the great illyrian revolt of 9 AD and some say formed circa 90AD . Plus the reallocation of 150,000 illyrian , do you think it was heavily E ydna ? these Illyrian cohors in Britain are made up of only 3 x dalmatian and 4 x pannonian ones. Since the first of these formed after the great illyrian revolt of 9 AD and some say formed circa 90AD . Plus the reallocation of 150,000 illyrian due to the revolt , do you think it was heavily E ydna ? ...........logicically I cannot see Illyrians bringing all the E to Britain as Roman legionaires. 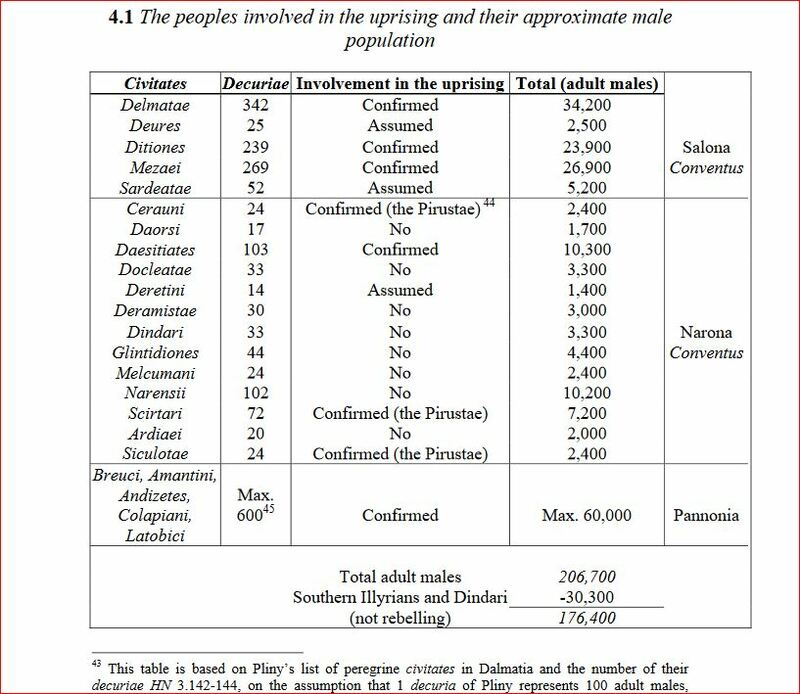 below is a list of illyrian tribes who fought in the great Illyrian revolt.........80 plus percent are northern illyrian as they are the ones that only had the manpower and the populace. Last edited by vettor; 12-12-2018 at 04:31 AM. is L17 correct or do you mean L117 ?